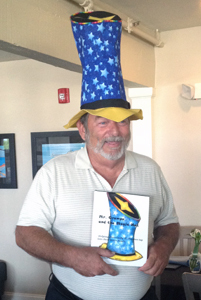 Mr. Grampa and The Magic Hat helps chronically ill children tap into their inner magic and empowers them to be brave. Russel Illes brings compassion, understanding and action together, creating a unique potential for facilitating healing and empowerment for critically ill children, families and caregivers. The Magic Hat Project uniquely addresses a child’s needs as well as those of the parents and caregivers. When a child learns to transform fear into courage, it relieves stress and anxiety for all concerned, creating a calmer healing environment. Imagine – Kids feeling more courageous and empowered, actively participating in their own healing process while the parents and caregivers are felling less stress and anxiety. Extended Community Involvement: Long range goals include expanding our existing community of like-minded people who reach out from a place of genuine knowing because they have similar experiences. Revenue from Hat, Book and CD sales supports expansion and ongoing funding of this support network, website development and future projects. Get Involved! If this project touches your heart, please send our links to your friends, family and business contacts asking them to do the same. Your support, sharing your resources – financial, professional and community – will help make a difference in the lives of many children and their families. Purchase a Magic Hat Product, like us on facebook, retweet one of our tweets, or share your story with us. Together we can grow this project that will help our most vulnerable population, our kids.